Amazon Price: $55.49 (as of October 16, 2017 12:52 pm - Details). Product prices and availability are accurate as of the date/time indicated and are subject to change. Any price and availability information displayed on the Amazon site at the time of purchase will apply to the purchase of this product. An amazing necklace design from Thai artisan Naree. 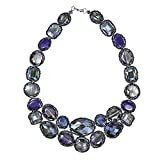 This unique necklace features reconstructed blue agate stones and crystal framed with beadings. Wear this necklace to make a statement anywhere you go. PLEASE NOTE: The handcrafted nature of this product will produce minor differences in design, sizing and weight. Variations will occur from piece to piece, measurements may vary slightly. ARTISAN STORY: Local artisan Naree grew up in Trang province in the southern part of Thailand. Naree's family members are merchants so she grew up learning about business and trade. She wanted to make and produce something of her own so she started learning about making jewelry and the processes. It took Naree years of practice but her skills improved and she was finally able to open her own shop in Bangkok. She loves to create beautiful handmade jewelry and is thrilled when others appreciate her designs.